As a pediatrician, I know that one of the most important things we can do to keep our children healthy as they return to school is ensure that they are up-to-date with their immunizations. At each visit, I take the necessary time to inform my patients and their families about the significance of immunizations. I welcome questions from parents and enjoy providing education. 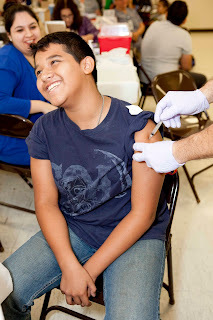 Immunizations prevent disease, disability, and even cancer. They are a cornerstone of public health, as they have helped eliminate terrible infections such as polio, diphtheria, and tetanus. Immunizations also protect our public’s safety by preventing outbreaks and the resurgence of diseases we have thankfully not seen in many years. In my practice, I take care of healthy children of all ages as well as medically fragile children with diagnoses such as prematurity, cerebral palsy, and leukemia. Some of those children with complex illnesses may be unable to receive immunizations because of a weakened immune system, as in the example of a child receiving chemotherapy for cancer. To protect all children, everyone without a medical exemption should receive the immunizations on the recommended vaccination schedule endorsed by the American Academy of Pediatrics (AAP). TMA Be Wise — ImmunizeSM event. Lately, more and more concerned parents are asking me about those children who have not received the necessary immunizations. In fact, there are nearly 57,000 children in Texas alone whose parents have opted out of some or all the recommended immunizations. This represents a 20-fold increase in nonmedical exemptions since 2003. This trend is incredibly worrisome to me as someone who has dedicated my career to the protection and well-being of children. As a result, we are again seeing measles in the United States. Measles was once considered eliminated in our country, thanks to a highly effective vaccination program. Currently, public health authorities are monitoring measles cases in more than 20 states, including Texas. In fact, there have been recent reports of pediatric measles cases in Plano and Houston causing vulnerable, medically complex children who can’t receive vaccinations to be kept at home. Measles is a potentially life-threatening illness that can result in permanent hearing loss, swelling of the brain, and pneumonia. Pediatricians know that vaccines are not only incredibly effective, but they are also safe. Trusted organizations such as the National Academy of Medicine, AAP, and the Centers for Disease Control and Prevention have conducted extensive research confirming this. Such studies have debunked a link between immunizations and disorders such as autism. It’s plain and simple — vaccines save lives. They represent one of the most critical public health advances in the past century. The ever-increasing number of children not receiving the recommended immunizations presents a clear risk to public health. Parents, pediatricians, and all who care for children must continue to advocate for sound leadership and public policy that promotes the importance of routine immunization. Our children’s lives may depend on it.